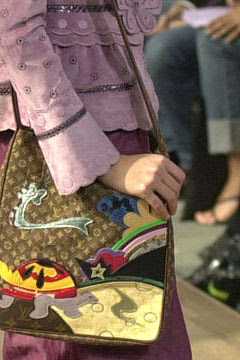 I've always been in love with the bags that Julie Verhoeven did for Louis Vuitton in Spring 2002. I don't ever troll Ebay for it because if I saw one I would be too nervous to bid on it and have it be a fake, and even if it was real, I certainly don't have the cash to actually win it. 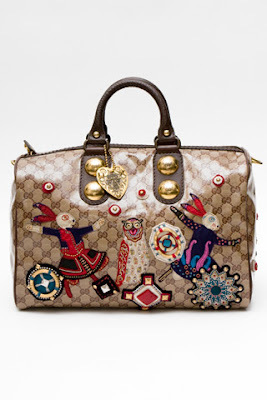 So you can imagine how I felt when I saw this Gucci bag in the Style.com Fall 08 accessory brouhaha. Uh, yeah, I'm gonna have to go ahead and say that uh, I need that bag in my possession as soon as its humanly possible. Seriously, it's ridiculously cute, and I'm not into cute at all, but I love this. Somehow the money will magically appear come fall, I just feel it. A magical bag deserves a magical purchase story. If only I bagged that Gucci bag for free on my NY trip...dream on Susie!